After installing HP Support Pack 8.30 on a DL380 G4 with Windows Server 2008 the fans is on full speed. To resolve this try to do a CMOS reset by turning off the server and disconnect the power cables. Set jumper 6 on the system maintenance switch (right behind processor 2) to on mode. Start the server to enter maintenance mode. Turn off the server and disconnect the power cables. Set jumper 6 to off mode. Start the server. If this doesn’t help try to disable cpqasm2 by editing HKEY_LOCAL_MACHINE\SYSTEM\CurrentControlSet\Services\cpqasm2\Start and set the value to 4. 1. 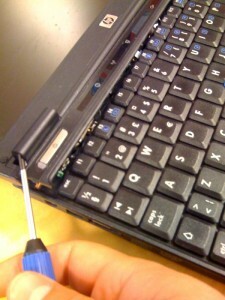 Remove all 6 keyboard screws. 2. Flatten out the laptop. 3. 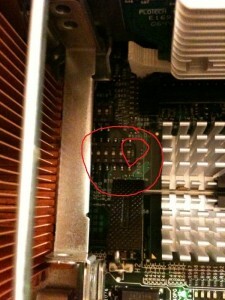 Use a small flate blade screwdriver to remove the touch sensitive panel. 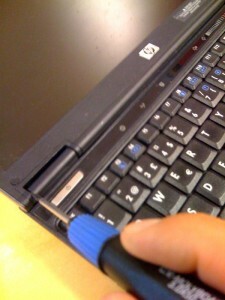 You dont have to disconnect the ribbon cable (connecting the panel to the laptop). Just lay the panel on top of the screen. 4. 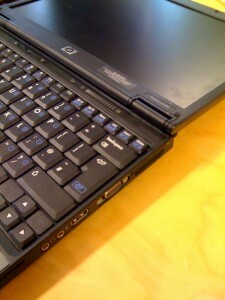 Disconnect the two ribbon cables(connecting the keybord to the laptop).